Another dreaded Google change has come and gone, and—just like so many times before—its passing has left many with a sudden sense of unease. With the Google Analytics Keyword “(Not Provided)” change—something that has made performance and keyword reporting a much more difficult task—a disturbance in the SEO world was felt, as if millions of search engine optimizers cried out in terror and were suddenly about to be silenced. Right on time people everywhere are already conjecturing and buzzing about “the end of SEO” and how all SEOs will soon be out of a job thanks to Google’s constant meddling with the site that we all pay homage to. The sky is falling, and there’s nothing we can do to stop it (just kidding). However, unlike the last time Google made major changes to the way we perform SEO…or the time before that (seriously, are we ever going to get past these panic episodes? ), this data obfuscation is worrisome enough where we don’t blame you for freaking out a bit. After all, our entire way of reporting and measuring the results of SEO work seems to have been up heaved overnight. So what’s next? How can we deal with the post “not provided” climate? Fortunately, like any good SEO team, we were ready for this change, and we can help you become so as well. What is the “Not Provided” Analytics Change? Before we get into details about what you need to do in order to keep up with the ever-changing climate, it’s important to understand what this analytics change entails. As many of you have noticed, over the past 2 years or so the keyword traffic data that we rely upon in Google Analytics has slowly begun disappearing and being replaced by the terrifying words “not provided”. At first, this was a trickle effect—only around 50% of keyword data was withheld by those horrible people over at Google. But, as time went on, and Google’s desire to protect people’s “privacy” increased (yeah right), this number grew and grew until finally, the change was announced, and all of our precious keyword data ceased to exist. With a heart that grew 5 times too big in the post NSA spy climate, Google decided to change all searches—even those from users not logged into Google profiles—to HTTPS, encrypting site webpage specific keyword information forever more. That brings us to today, where marketers everywhere are frantically trying to discover new ways to measure their efforts with analytics. Even though this is a pretty major analytics change, and one that threw a lot of companies who were not prepared to deal with it into flux, the brightest minds in the industry have been working for quite a while in preparation for this analytic apocalypse. This, of course, has resulted in quite a few workarounds which, while less effective than previous methods, should help keep your SEO efforts on even keel until better methods are invented. Webmaster Tools: Perhaps the best way to get semi-specific data—including keyword data—is through Webmaster Tools. Fortunately, Google was nice enough to still provide information on search queries (using the Search Queries option) in Webmaster Tools, rendering it a now indispensable tool. On top of this, Webmaster Tools provides a ton of filterable data about specific landing pages on your site that you can use to monitor your efforts, including impression versus click data and click-through rate. While this information isn’t quite as specific or useful as Analytics keyword data was, you can still take the aggregate of all this and use it to see how your site and its specific webpages are responding to your SEO efforts. Did the click-through rate increase? Are your impressions improving? Then you must be doing something right on that page. Continue using this information to tweak and improve on your SEO work and you should be A-OK. Just remember; Webmaster Tools only saves data for the past 90 days, so make sure you download said data on a regular basis so you can continue to build out your own historical datasets. Google Trends: While Google Trends won’t give you an idea of who is visiting your site, it can give you a constantly updated list of “hot” keywords that have the potential to bring you traffic. Just set up trends to track keywords that relate to your site’s vertical and mine the results for ideas; it also can help you understand precisely why you are or are not getting traffic. Without Analytics keyword information, it can be hard to determine why you get traffic spikes; fortunately, Google Trends can help you understand the reasoning behind it, giving you an idea of where to go from there. Look at your Overall Site Data: It’s obvious that using Webmaster Tools and Analytics in tandem is going to be the key moving forward; with that in mind, you must use your overall site data (i.e. visits, bounce rates, unique visitors, etc.) provided by Analytics in addition to specific webpage statistics to understand the performance of your site and improve said performance. Truly, having a benchmark in place can save your SEO efforts. Internal Site Search: Analytics can be used to track the searches made by users on your site. It takes a tech savvy mind to do so—follow the directions here if you need them—and it might not give you a completely accurate picture of how people are reaching your site, but it can answer questions about how easily they find information, as well as what they more than likely searched to get to your site in the first place. Again, it’s not as specific as Analytics keyword data was, but in this post keyword change climate, you need to grasp at every straw you can get ahold of. Listen to the Smart Guys: These are only a few of the ways we’ve discovered to deal with “not provided” data; however, there is a wealth of information and truly intelligent SEO types out there that can help you move in an even deeper direction. For a much more technical look at this Analytics change, check out Avinash Kaushik’s article about dealing with the https “not provided” change. It’s a bit heavy, but it’s definitely one of the best resources out there. 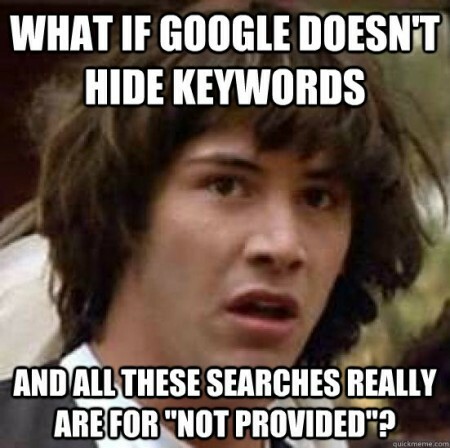 He also recently published an update to this post titled Search: Not Provided: What Remains, Keyword Data Options, the Future and it’s definitely worth a read. In the end, just remember that even though Google is seemingly doing its best to screw with SEO, there’s always going to be a fix or a workaround. In other words, don’t panic. SEO (like we continually say) isn’t dying! With the information provided here, you’ll be able to keep your site and SEO efforts on track, and that’s not going to change anytime soon. We may have to roll with the punches—and we admit, Google threw a haymaker here—but everything is going to be just fine. Just follow our lead and we’ll help make sure your SEO efforts are never in vain!